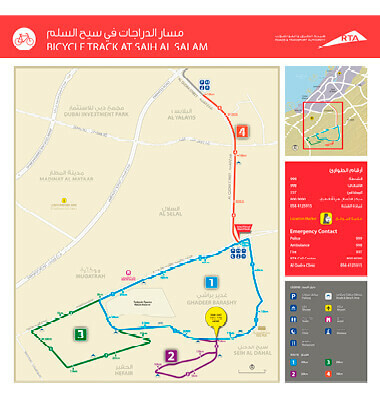 Explorer developed useful cycle route maps for the Dubai Road & Transport Authority’s (RTA) bicycle track at Saih Al Salam. Designed according to RTA’s brand guidelines, and using stark colours to distinguish between different routes, the maps contain essential information such as the location of shaded rest points, clinics, mosques, showers, toilets and parking. Displayed at key points along the route, as dual-language Arabic and English location maps, they show the four available tracks, their lengths in kilometres, as well as distance markings.